Most of us have heard that Ross Dress For Less is coming to 918 Montrose Avenue. A reader found the sales brochure for the remaining retail parcel on the land (4800 sq ft), and it also gives us a better idea of what the layout of the new construction will look like. 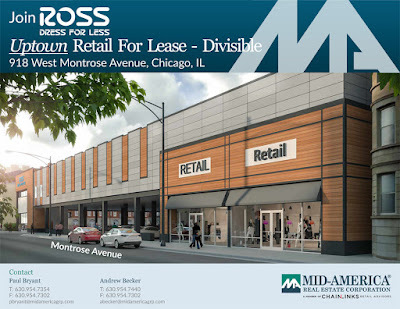 Ross will be on the westernmost side of the former Dearborn Wholesale parking lot, closer to Sheridan, then there will be enclosed parking in the middle of the property, then the available retail portion on the east side of the property. 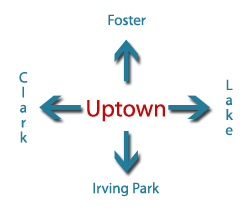 Got any contacts interested in setting up shop in Uptown? What would you like to see there? The links to the site plan and the sales brochure can be found here. And remember, there will be a dryer sale this weekend at the site, Saturday-Sunday, cash and carry only. 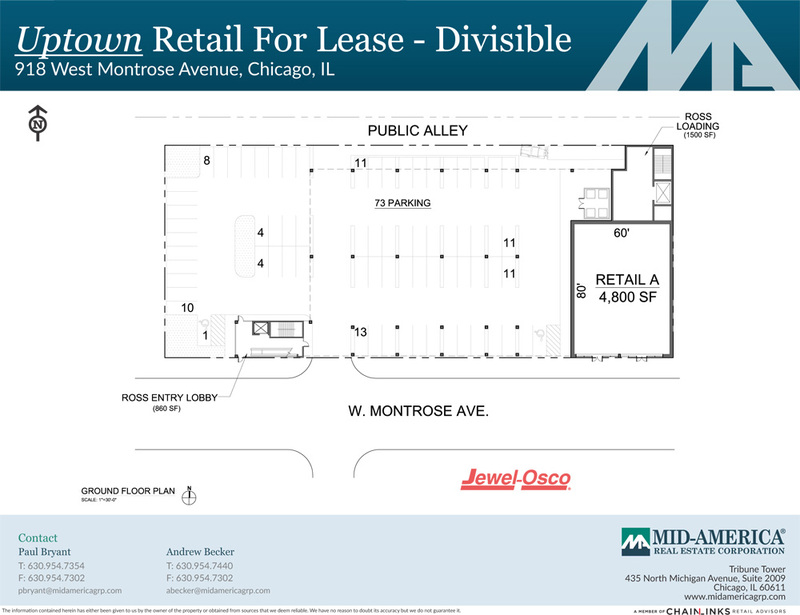 Ross has one space, and the remaining 4800sf are still available. They should put a Potbelly's, Panera or a GNC, Vitamin Shop in the remaining retail space. But what Uptown really needs is a really good brunch place. Yolk should have moved into the Flats building on sunnyside and Broadway instead of that mattress store. That would have been a perfect corner for a brunch restaurant which would definitely bring in more foot traffic along Broadway. Yes, Potbelly's, Starbucks, Peet's...someplace that people can have a bite and hang out for a bit. NO nail salons please! I agree. People leaving World Gym could use a vitamin store or a place to grab a bite after working out. Corner Bakery, Lou Mitchell's, Walker Brothers Original Pancake House, or something similar serving, breakfast, lunch, and dinner. We don't need another bar & grill. There is already a Starbucks in Target. What can we do to avoid another Mattress Firm, we already have 2 in the same block on Broadway, they seem to have this strategy all over the metro area, I have seen as many as three on the same corner. Another phone store would not be a gain for the neighborhood either. I think the crime around here is a deterrent to some businesses, it seems that every store that opens needs an armed guard. 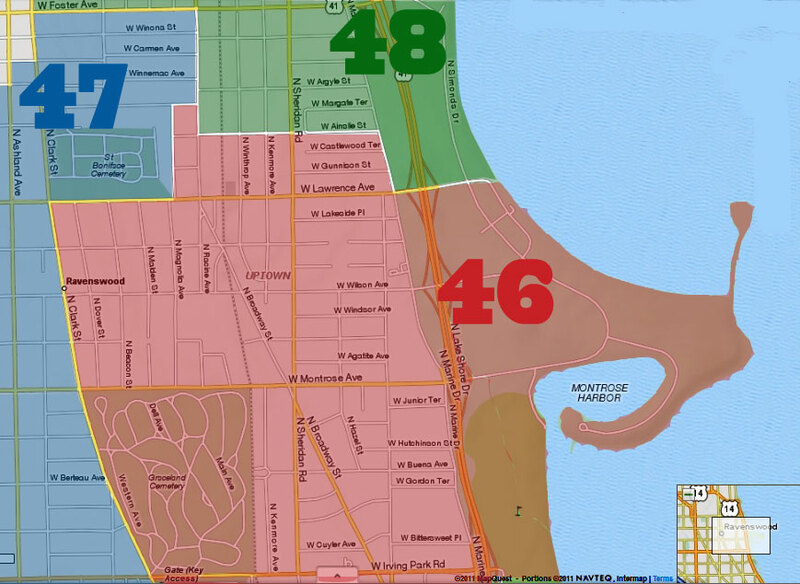 How could we work together to encourage a restaurant, or another business that would be a net plus for the neighborhood ? It's just a matter of time before most of those mattress stores go out of business. There's too many of them. How about bringing in a better fast food place, like a chipotle? There's a new Chipotle on Broadway and Foster. I doubt they will open another nearby. I know about that one, but there's also a Dunkin Donuts/Baskin Robbins near there and another one right off Wilson...and lets not forget Jewel!